The expression 'don't judge a book by its cover' applies to this rugged root vegetable. Underneath the knobbly exterior is a sweet and nutty flavour with health benefits to boot. 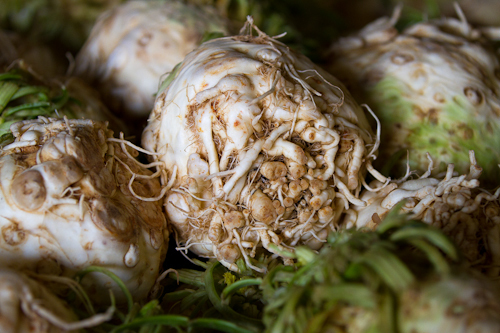 We started to grow celeriac in 1992 and now have very specialist knowledge about how to grow this challenging crop. The celeriac seeds are grown in modules under glass and are delivered to the farm and planted using our 9 row planting machine. Once the plants are in the ground, the early celeriac is covered with polythene sheeting to help retain the ground temperature and moisture. The wind always blows and it takes an army of people to ensure it is dug into the ground securely. Once the days are longer and the temperature has risen, the polythene is taken off and rolled up to be used again for the following year if in good enough condition. Covering the early crop of celeriac has ensured it can be harvested in August. 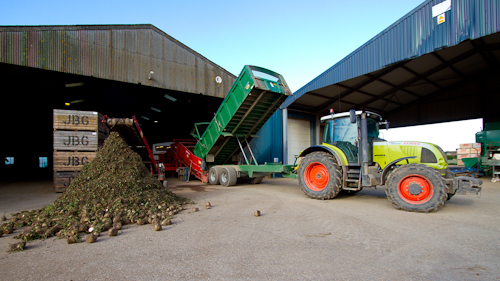 Over the summer the size and quality of the celeriac is being constantly monitored as well as for pests and diseases, such as carrot root fly. Celeriac is notoriously difficult to store. We say that celeriac is the vegetable equivalent of sheep. While sheep spend their lives thinking of new ways to die, celeriac thinks of new ways to rot! We have twenty five years’ worth of experience and it is still not enough.